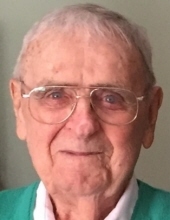 James Patrick Savage "Big Jim"
Celebrating the life of James Patrick Savage "Big Jim"
Obituary for James Patrick Savage "Big Jim"
James Patrick Savage "Big Jim,” 94, of Fairmount, passed away Tuesday, March 26, 2019 at The Centers at St. Camillus. He was born on St. Patrick’s Day in 1925. A lifetime resident of the Syracuse area, he was a 1944 graduate of St. Anthony's High School. Jim was employed with AT&T for 38 years. He was a communicant of Holy Family Church and St. Anthony of Padua. Jim was a great man, father, grandfather, friend and example of a true gentleman who loved spending time with his family. His most cherished memories were made at his camp at Sandy Pond, enjoying a game of horseshoes, a cold beer, a round of golf and an occasional ice cream. Jim was predeceased by his first wife, the former Frances Gaffney, in 1982; son, Michael, in 2018; three brothers; and grandson, Patrick Savage. Surviving are his wife of 32 years, the former Marcella (Hunter) O’Brien; children, Jim (Nancy) Savage of Florida, Tom (Judy) Savage of Oregon, Dan (Kathy) Savage of Rochester, Pete (Beth) Savage of Syracuse and Peggy (Tim) Byrne of Syracuse; daughter-in-law, Chris Savage of Syracuse; 16 grandchildren; eight great-grandchildren; and several nieces and nephews. Relatives and friends may call Sunday, March 31 from 1 to 4 p.m. at the Buranich Funeral Home, 5431 W. Genesee St., Camillus. A funeral Mass will be celebrated Monday, April 1 at 10 a.m. in Holy Family Church, 127 Chapel Dr., Syracuse. Jim will be laid to rest in St. Agnes Cemetery, Syracuse. In lieu of flowers, contributions may be made to St. Anthony’s Alumni Association, c/o Jim Wright, 216 Whitestone Dr., Syracuse, NY 13215. To send flowers or a remembrance gift to the family of James Patrick Savage "Big Jim", please visit our Tribute Store. "Email Address" would like to share the life celebration of James Patrick Savage "Big Jim". Click on the "link" to go to share a favorite memory or leave a condolence message for the family.